Had a little time to stomp around shooting a new blog post, before the Christmas Holiday period truly takes over. 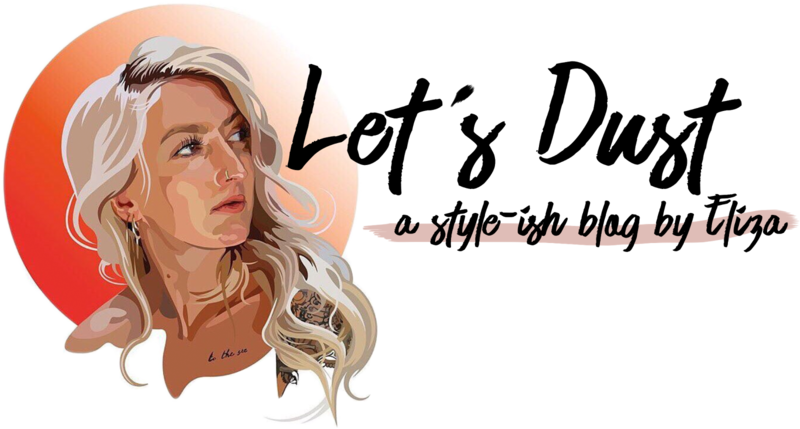 I just wanted to talk about this look, as probably my last post of the year, and as it has to be one of my typical outfits, no matter the dress code. Tights are a big NO NO for me, so pretty much regardless of the cold air I bare my bare legs all year round and love a thigh high boot for this reason. 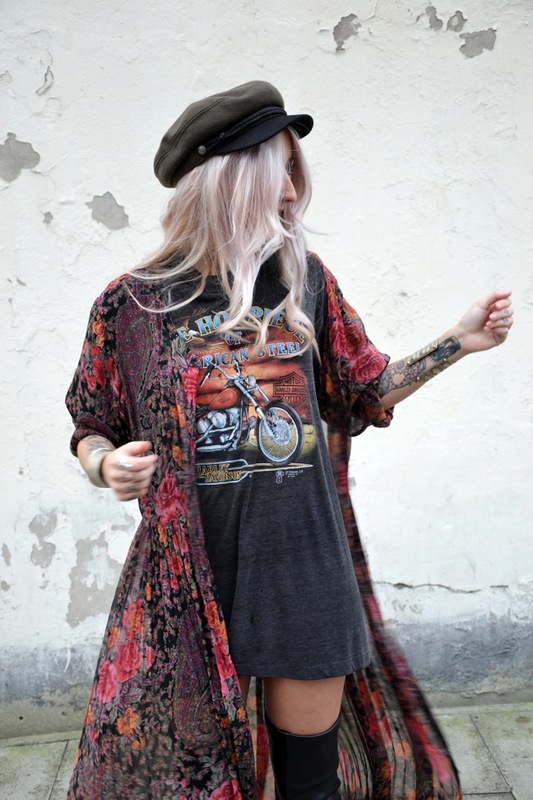 I love to dress with a little naughty seventies, rock 'n' flair and always with that laid back approach. 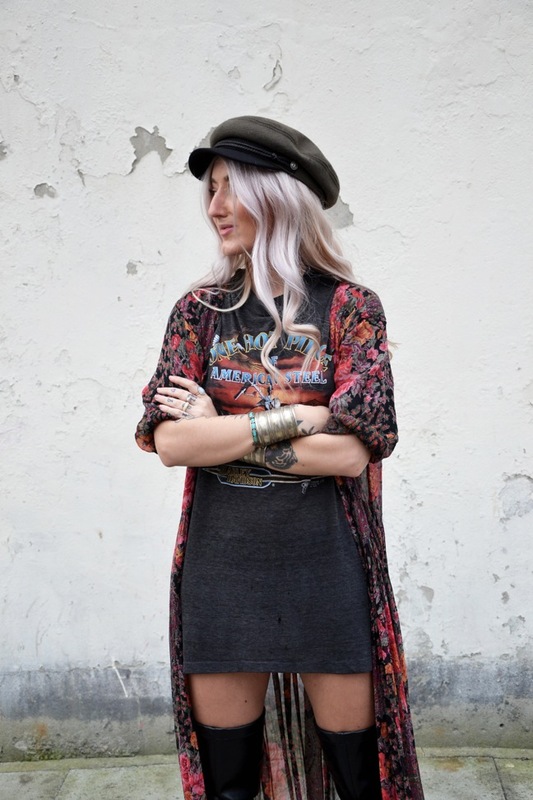 Layering on the vintage paisley maxi dress, worn undone over a loose t-shirt, with my brand spanking new fiddler cap is the perfect way to incorporate my inspirations from the past. 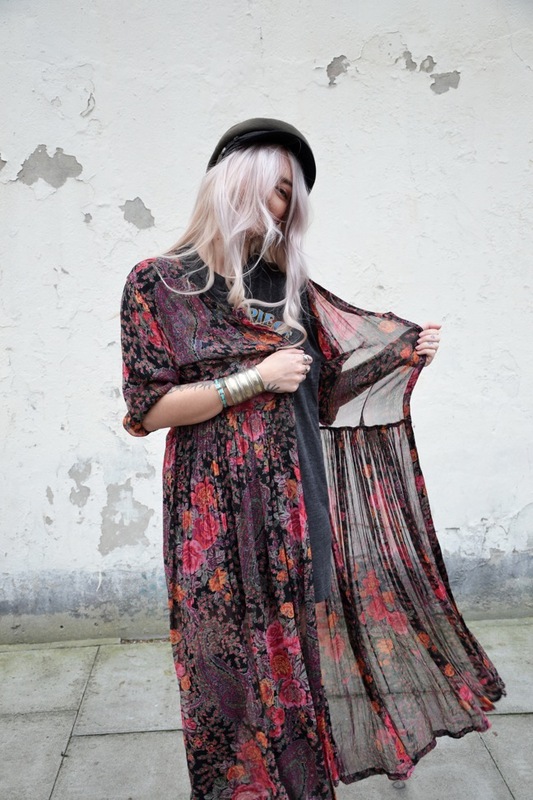 Patterns, loose fits and mixing with textures! 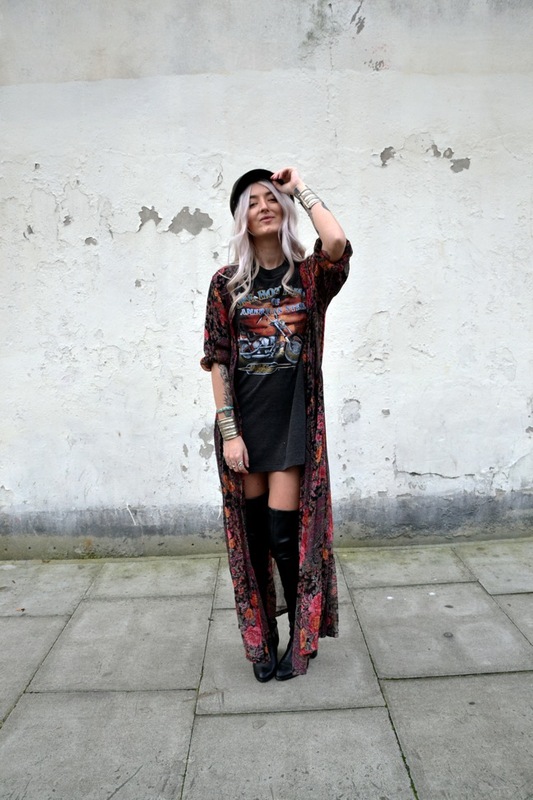 Groupie, hippy, bohemian babe, rocker vibes all the way. 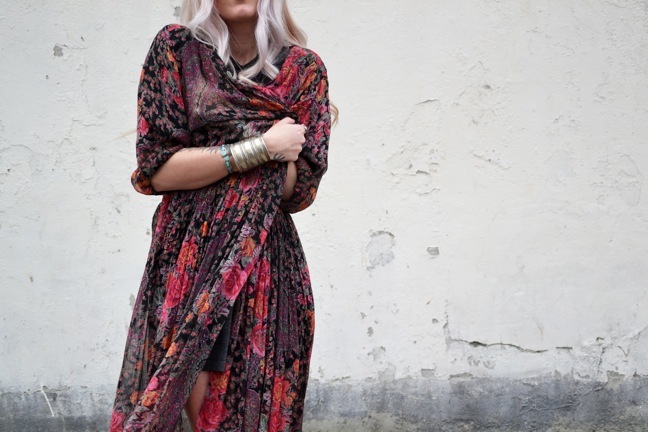 I picked up this maxi dress from 5678 Vintage, when having a mooch at the my local - East London Vintage Fair. I always spy really unique and beautiful treasures there so ddefinitely worth a trip, if your around Hackney way - it happens every second Sunday of the month. I am in love with my new cap, a gorgeous gift from my lovely pal Sara. I assure you, it wont leave my head for at least two weeks straight now - (it occurred to me, that I've worn a hat pretty much everyday since September) What can I say? Some girls like bags, lip fillers, real fur... I like hats. 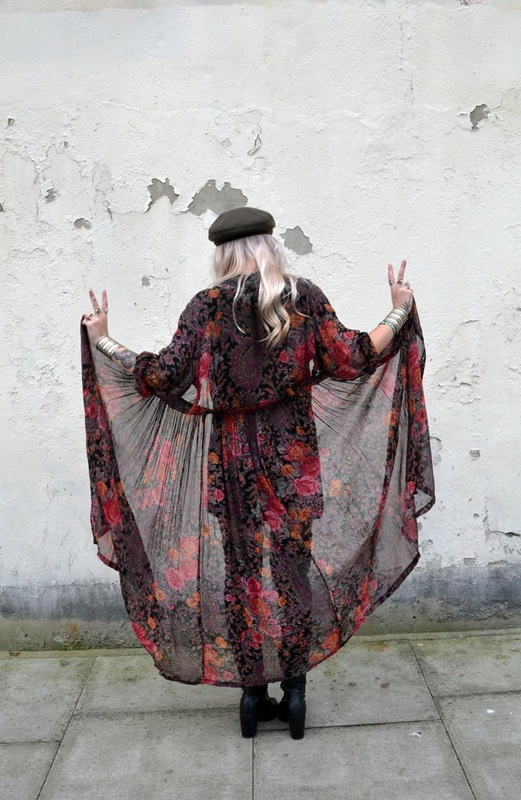 Vintage Maxi Dress, worn as a kimono - 5678 Vintage. 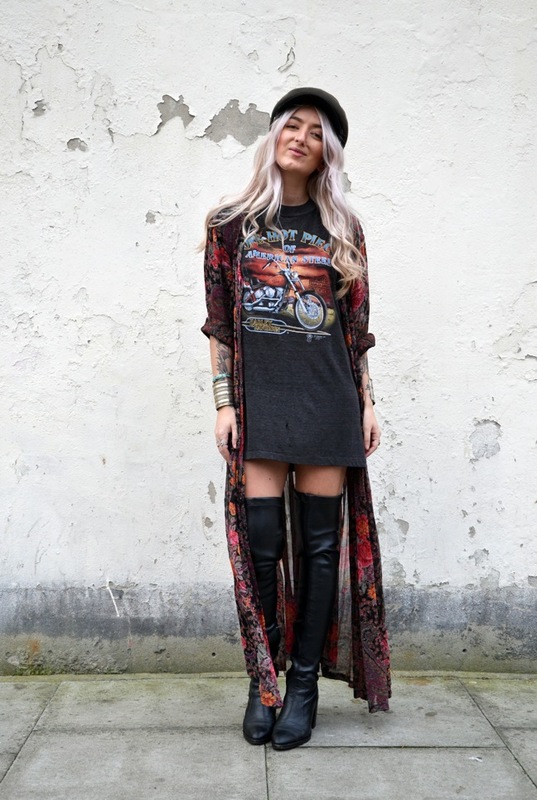 Vintage Motorcyle T-shirt - Beyond Retro. Thigh High Boots - Topshop. 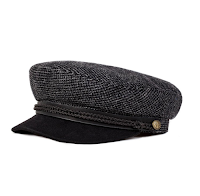 Newsboy Hat - Brixton. 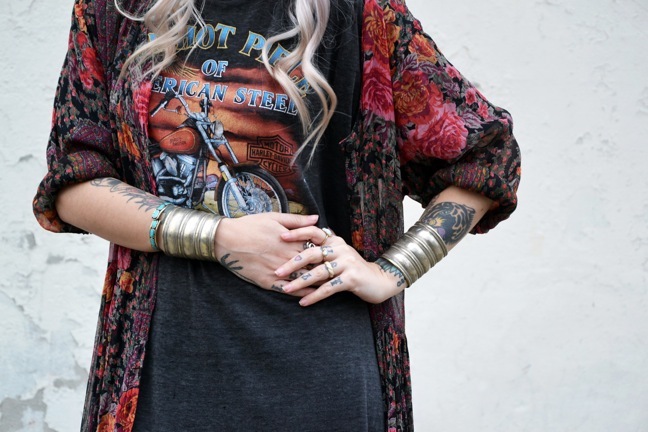 Cuffs - Borrowed from a friend, Portobello Market.